Last semester, I was named sports editor of the CSUDH Bulletin. At first, I was intimidated. I wasn’t sure what those responsibilities entailed, or if I could handle them, but I was told that since I was in charge of the section, it could look however I wanted it to look. I knew one thing: I wanted to focus some attention on those rare CSUDH athletes who beat the odds and actually made the professional ranks. But what I realized is that working in professional sports isn’t limited to playing. From careers in sports medicine, officiating, working in the front office of a professional sports franchise and many others, there is a myriad of sports-related careers available for non-players. Maybe you could even follow my route: switching my dream from being a professional athlete to becoming a sports journalist. In third grade, my teacher, Ms. Domonquer, told me to find a career that I loved. That advice always stuck with me, and I knew that career would have to be sports. Some of my earliest memories are of my father and uncles talking about sports news every Friday and Saturday. It was a weekly routine and once I learned about sports, I eagerly joined the conversations, which at points would grow so heated hey would anger my mom and aunts. On Saturdays, my brother and I would watch soccer matches on cable TV from the time the roosters began crowing until around 7 p.m. and when our father arrived home at 8 p.m., we would rush to the door and overwhelm him with our detailed recaps of every game we had seen. Little did I know that these eyewitness accounts of what I had seen would eventually become a viable career. But in my adolescent and teenage years, my dream wasn’t to write or talk about sports; I wanted to play fútbol for Mexico City’s Cruz Azul, my father’s favorite professional soccer team, a team he had devoted passion for, which he passed onto me. But early on I realized that it was completely out of my reach. For one, I didn’t have the best natural skills and secondly, I didn’t have the contacts or budget to hire a personal coach to continue pursuing that goal. So now I don’t dream of becoming the next Lionel Messi or Cristiano Ronaldo but rather a reporter who will serve as a conduit for fans to read, hear or see information about the biggest stars in the sports world. 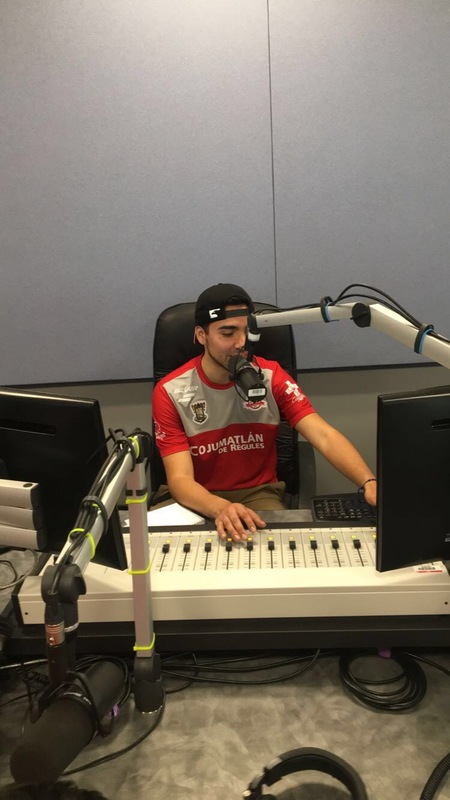 Since the decision to follow this dream; I have interned at Telemundo Deportes (my biggest milestone was covering Kobe Bryant’s farewell from basketball), interned at Panamerican FC (a third-division U.S. professional soccer team), started my Spanish-sports podcast Toreando los Deportes (Toro-ing Sports) at KDHR, our campus radio station, and became sports editor for The Bulletin. Now that I finished my studies at CSUDH, I seek to increase my sports knowledge in México by studying this August at the institution of Jose Ramon Fernandez (an ESPN reporter) and during my stay in Mexico City I hope to land a job with Cruz Azul. I have become so committed to this profession that this semester I signed up to continue being the sports editor, even though I have already graduated from the university. Sure, sports journalism was plan B and came only after I realized my main dream of playing professionally would never happen. But I couldn’t be happier. Not only do I love talking to athletes, learning more about sports, and engaging in conversations with anyone about anything sports-related, I also feel, in my own way, that I am following a familial legacy. Many parents feel pride in passing on their athletic skills to their children and are disappointed when their kids don’t make it professionally. But through passing on to me their knowledge and love of sports, my father and uncles helped light a fire for me to do that professionally. I guess, in a way, I am now searching for a way to continue passing on sports news to my father and uncles. Tune in to kdhr.net every Friday at 12 p.m. to listen to Toreando los Deportes.